Review date: 20 May 2004. The ideal listening environment is, except for the music, quiet. The typical listening environment for a lot of people these days, most definitely including those of us who spend a lot of time in a room with a lot of computers, is noisy. If you're listening to something pretty raucous then this doesn't matter a lot, but even then, the constant hum of cooling fans, rush of traffic or hubbub of a busy office can be annoying. The simplest solution to this problem is to use sealed headphones. Sealed headphones have, as the name suggests, earpieces that are each a little sealed enclosure, which is in turn sealed against your head by the ear-pads. Sealed phones are harder for the designers to make sound good than open-back designs - which have some sort of grille on the back of each earpiece. But sealed 'phones they give much better "isolation" - attenuation of ambient noise. So here are a couple of sets of sealed-back 'phones from Sennheiser. The bigger ones are the HD 270s; they have a conventional "circumaural" design, in which the ear-pads completely surround your ears. Here in Australia Aus PC Market sell them for a rather hefty $AU297, including delivery. The smaller ones are HD 212 Pros. They've got an unusual pseudo-circumaural design; their ear-pads look like conventional circumaural ones, but they're only big enough to sit on your ears, not surround them. They sell for a much more affordable $110 delivered. The HD 270 headphones may be a bit on the pricey side, but they don't really look it. There's a lot of cheap-looking matte grey plastic there, and the fake leather ear-pads and similarly vinyl-y headband padding don't exactly scream "premium product" either. But the plastic means they only weigh 220 grams (7.8 ounces) without their cable; Sennheiser's recent models are all lighter than you'd think, but still robust. The HD 270s are decently comfortable, too. They hardly squeeze your brains out through your nose at all. Sealed headphones all tend to be more head-clampy than do open-back designs, because they need to make a decent seal around, or onto, your ears. Open-back 'phones just have to stay on your head, which for full-sized home-use models (that don't expect you to go jogging while wearing them) means they don't need much pressure at all. Sealed 'phones are different; the only kind of sealed headphone that doesn't squish your head at least a bit is the "canalphone". That said, though, the HD 270s feel OK. You can't make a sealed headphone that's much more comfortable than this. The much cheaper HD 212 Pros look, I think, rather better than the HD 270s. Silvery plastic, shiny inserts on the ear-cups, and nicer looking ultra-thin pad fabric, too. They weigh only about 130 grams (4.6 ounces) without a cable. Unless you've got no ears to speak of, the 212s are "supra-aural" headphones. They sit on your ears, not around them. I was surprised at how comfortable the 212 Pros are, though. Their earpiece and headband padding is very soft, and if you adjust them properly (the earpieces slide up and down in channels on the fixed headband; the trick is to adjust them more loosely than you think is necessary), they're surprisingly wearable for quite extended listening sessions. Big soft circumaural open-back 'phones are still much more comfortable, mind you, but the pivoting earpieces of the HD 212s still do a lot less ear-squishing than I expected. Here are all of the plugs from both ends of the 212 and 270 cables; HD 270 on the right, HD 212 on the left. They both have cables that plug in (yes, smart alecks, at both ends...), with nice standard connectors. Well, fairly standard connectors, anyway. 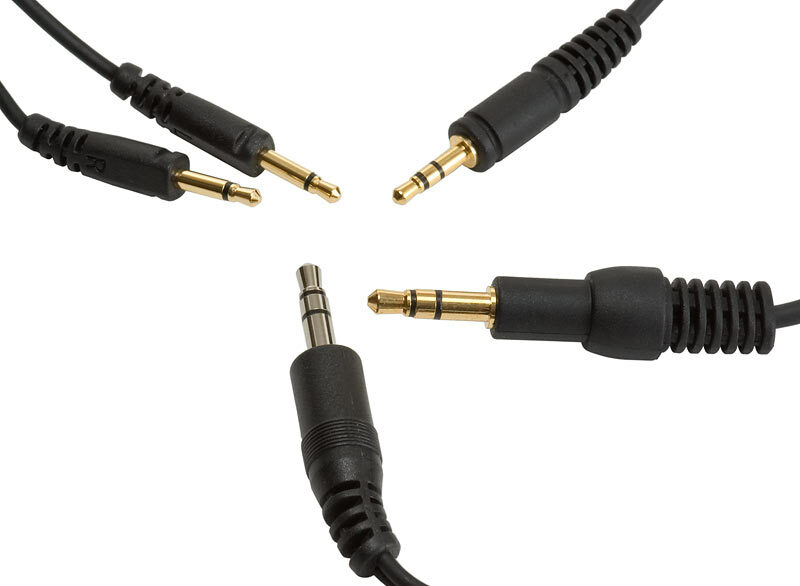 The plugs at the input end are, of course, ordinary 1/8th inch stereo units (both sets of headphones also come with a quarter-inch plug adapter), but the ones at the other end are the smaller 1/10th inch size. Apart from making it possible to replace damaged cables without any soldering, the plug-at-each-end design also makes it less likely that you'll damage the cables in the first place. When you stand up while wearing these headphones when their cable, unknown to you, is hung up somewhere, the plugs at the headphone end will just pop loose. The 270s, being more expensive, can afford to have a wire going through the headband to feed the right earpiece; their cable therefore plugs in only on one side, with a stereo tenth-inch plug. Single-sided connectors are good; they make it impossible for the headphones to garrotte you when you take them off. The 212 Pros, being cheap, have a cable entry point on each side, with a Y-shaped cable terminating in two mono tenth-inch plugs at the headphone end. They also only have a nickel plated 1/8th inch connector, versus the less-corrosion-prone gold plating on the 270 plug. In the real world, this is unlikely to make any difference. Doffing my usual HD 590s (an excellent example of a big soft circumaural open-back headphone, yours for $AU429 delivered from Aus PC Market...), I tried the HD 270s first. My initial impression was that they obviously have a whole bunch of isolation. The thrum of the computer room dwindled mightily; even my deafening keyboard was barely audible. Full marks for noise reduction, then. Next, I noted that they don't have the big fat bass boost that many sealed headphones offer. Bass boost is a feature, not a bug, for a lot of people; if you miss the bowel-loosening WHUD of your elephantine subwoofer when you're listening with headphones, a pile of bass boost in the 'phone tuning may make you all teary-eyed. Gamers are likely to enjoy it, too. But, for what it's worth, the bass response of the HD 270s is pretty smooth. Well, to coin a phrase... oh dear. When I listened to electronica and metal and games, the HD 270s didn't sound too bad. When I listened to music that makes it easier to tell if Bad Things are happening to the frequency balance, though, it was obvious that these headphones are not, in point of fact, very good at all. Compared with really cheap sealed headphones (entry level price point: Less than $AU25...), the HD 270s sound terrific. Most cheap sealed 'phones have severe resonance issues, and very crummy drivers that bring their own weirdness to the table, and the result may suggest that a tin can telephone features somewhere in the signal chain. 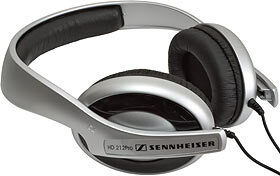 But by the standards one should apply to $AU300 Sennheisers, the HD 270s are really quite dreadful. Terms like "muffled" and "muddy" and "severe coloration" and "they cost how much?!" sprang to mind while I listened to them. Nothing carrying the Sennheiser name, at any price, should have clearly audible ear-cup resonances, but these things certainly seem to, and they're not even cheap. I swapped the HD 270s with other headphones a few times, and got sick of saying "eeew!" and "yeargh!" and "blecch!" every time I put the 270s back on, so this is where my sonic evaluation of them stops. If these things cost $AU75 delivered, they'd be worth considering. At $AU297, they're a joke. On to the HD 212 Pros. Better, surprisingly enough, than the HD270s, despite being well under half the price. Actually, the HD 212 Pros are everything the HD 270s aren't. Clear, crisp, insert other complimentary audiophile jargon here - and bassy. M'verygoodfriends at HeadRoom also sell the HD 212s, and have helpfully whipped up some detailed specifications for them. The frequency response chart tells the story. Phwoar, look at the bass response on that! It's not just a one-note-bass spike on the graph around 60Hz, though; that's what cheap "bassy" sealed headphones normally deliver. Instead, at around a rather midrange-y 150Hz, the 212s' low frequency response shoots up. It roughly plateaus at something between +5dB and a mighty +10dB (the discrepancy between channels is probably testing error), and doesn't come back down until below 40Hz. What this means to the listener is that while these headphones have more bass than any audiophile is ever likely to want, they aren't un-musical about it. They sound as if someone's carefully wound up the bass on a good equaliser, not just poked up one fader on a Radio Shack blinkenlights graphic EQ and wandered off. Listening to the HD 212 Pros through different amps wound up to hazardous-to-hearing levels confirmed that they're built to take some kicking, too. No buzzes or clicks, even at full ear-massage levels. So if you like your drums, explosions, dinosaur footsteps and thud and blunder loud, these are the headphones for you. They've got good isolation, too. Not as good as the HD 270s, but still far superior to any open-back 'phones. This isolation graph shows that pretty much everything below 400Hz gets through unmolested - which is normal; it's hard to keep out bass - but the 212s become very effective mufflers above about 800Hz, which is where a lot of the irritation value of most ambient noise lives. Rushing fans, passing traffic, people yammering away; all in the higher frequency range. And all quite nicely blocked, by this pair of headphones that don't cover your whole ear. I rather like the middle-sized design of the HD 212s, actually. They press around the edge of the ear, so they're not too uncomfortable, but they're still clearly much smaller than traditional circumaural 'phones. This makes them suitable for portable use. You should avoid wearing full-sized headphones when you're out and about, partly because they're a tad cumbersome, and partly because they make you look like a goober. The HD 212 Pros aren't entirely non-dorky, but they're pretty darn slick compared with a big old pair of audiophile cans. So - HD 212 Pros good, HD 270s bad. I can't think of one good reason for anybody to buy a set of HD 270s. If you're a DJ who needs some sealed 'phones with good isolation for gigs then you could certainly use 270s and, probably, not even notice their profound sonic ordinariness; they've got the isolation that DJs need, and they're decently comfortable. But there are plenty of other sealed-back options from the other big names in headphones that cost considerably less than the HD 270s, and I'll bet you a kidney they sound better, too. 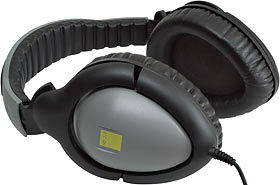 Heck, even a pair of Koss UR20s doesn't sound much worse than the HD 270s - and the UR20s cost twenty US bucks. There are plenty of headphones out there that sound much worse than the HD 270s, and people buy them and use them. The HD 270s certainly sound rather better than certain novelty headphones I could mention. What a headphone aficionado thinks is dreadful, abysmal, unconscionable, ought-to-be-banned-by-international-treaty, Joe Average won't mind at all. But you can do ever so much better for this much money. The HD 212 Pros, though, are great, with two caveats. Caveat one: All that bass. If you don't want headphones that shamelessly wave the drums in the air like they just don't care, then you don't want HD 212 Pros. Caveat two: They're not as comfortable as circumaural 'phones. They're not very uncomfortable, though; only if you wear headphones for many hours on end, or have very touchy ears, will you be likely to care. Still, if you're a coder/gamer/fanatical music-lover who is only headphoneless when bathing or sleeping (and not always then), the HD 212 Pros will flatten your ears. Be warned. 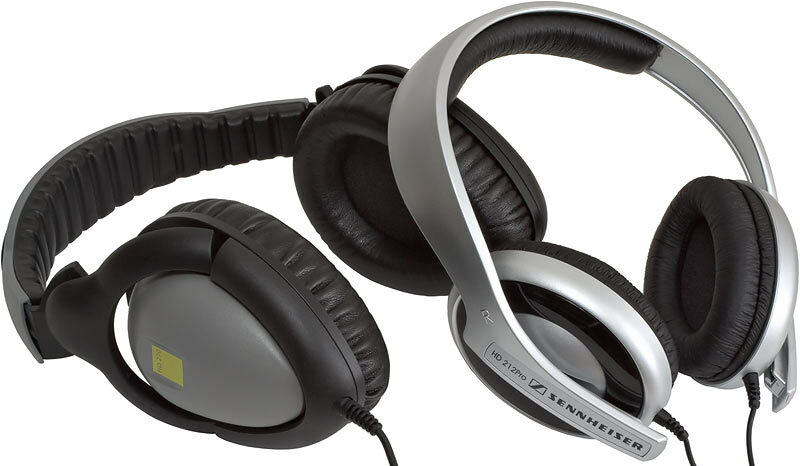 That said, though, I think the HD 212 Pros really are excellent, particularly at this price. Readers from Australia or New Zealand can purchase these headphones from Aus PC Market. To buy a set of HD 212 Pros, click here! If you're NOT from Australia or New Zealand, Aus PC Market won't deliver to you. If you're in the USA, try a price search at DealTime!